Camp managers, get your green thumbs ready, as Jack has appeared for a special Halloween gardening event in Animal Crossing: Pocket Camp (Free). It’s the perfect timing, as the Splatoon events just ended. Part one is on now, with part two coming early next month. There’s also been special spooky terrain added to add some extra creepiness to your camp while you decorate for the holiday. Jack with the jack-o’-lantern head has travelled to your campsite in search of special bats that can only be found via lollipoppy flowers. 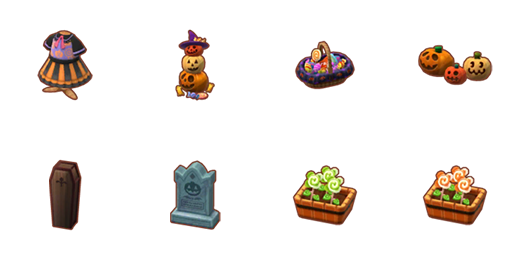 This first part of the event features apple and peach lollipoppy seeds and flowers, which attract spooky and eerie bats. Collecting bats will earn you clothing and furniture rewards, as will trading certain lollipoppy flowers with Lloyd. 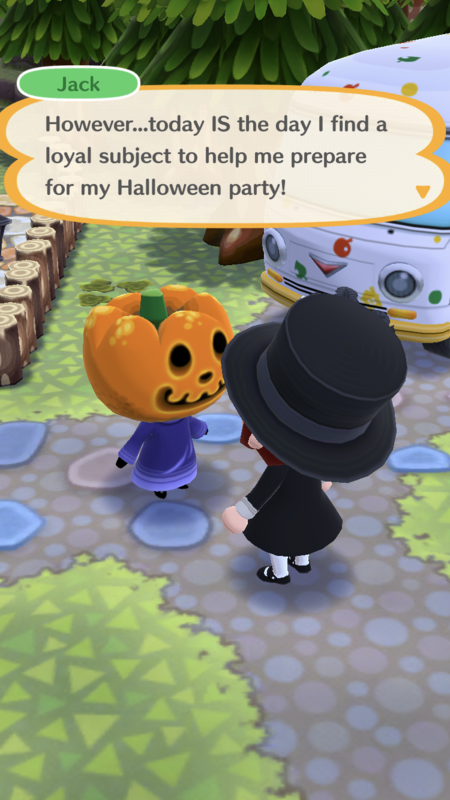 Trick-or-treating is an integral part of Halloween, and the one piece of clothing available during this event is made for it: the trick-or-treat dress. With a black and orange striped skirt and purple with orange flowered bodice, the dress just looks like Halloween, and I can’t wait to earn it and dress my manager. The majority of rewards this time around are furniture-based, making for one creepy campsite by the end of the event. During this first part, you can earn two stack-o’-lanterns, two trick-or-treat baskets, two witchy jack-o’-lanterns, three creepy coffins, and four pumpkin gravestones. You can trade lollipoppy flowers with Lloyd to receive potted apple or peach lollipoppies. While the gardening event can cost you nothing but time, if you want the spooky terrain it’s going to set you back an awful lot of Leaf Tickets (LT). The spooky middle ground costs 250 LT, the foreground costs 150 LT, the background is another 150 LT, the sky is a whopping 300 LT, the fence is 200 LT, and the spooky wooden deck costs the least at 50 LT. 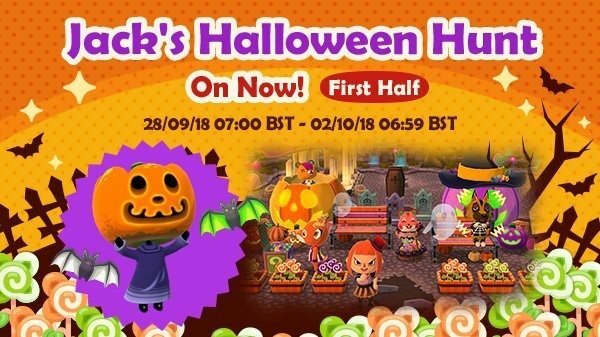 This isn’t the end of the Halloween season on Animal Crossing: Pocket Camp, as the second half of the gardening event begins at 2 a.m. EDT on October 2; it will bring with it one new flower, two new bats, and lots of new spooky-themed rewards. From October 1 to December 31, Muffy’s Creepy Cookie will be available from the premium Fortune Cookie Shop, further adding Halloween-themed decorations. And for those who want Jack to visit their camp again post-event, Jack’s Puppet Theatre will be available as premium furniture from October 9 to December 8.